Since this is my first post addressing something in the world of health, I would like to start with a disclaimer. I am NOT a nutritionist. I am NOT up do date on any personal training certifications of any sort. There’s a very real chance that I don’t know what I’m talking about. You should check with your doctor and medical professionals before changing your diet or workout routine. I encourage you to always research anything you read regarding your health. Don’t just take your trainer’s word for it or assume that your favorite magazine or blogger or YouTuber actually knows what they’re talking about. Health is a very important issue and as such, it’s wildly complex and even people with the best of intentions can get confused and pass on information that isn’t 100% reliable. That being said, improving your health is a process. A long and somewhat never ending process. That process is made up of millions of choices and millions of small changes in your lifestyle and daily habits. Today I wanted to talk about one of those small changes: What do you eat for lunch every day? If you’re part of the work force, do you go out for lunch? Stop at the store and pick something up? Grab some drive through? I’m not saying that any of those choices are wrong (I love me a salad from Publix or better yet a Grilled Stuft Burrito…mmm…burritos…) but they do leave you at the nutritional mercy of whoever is preparing your food. If you really want to take control of what you consume to fuel your body, one of the ways you can do that is to prepare your own lunches at home and “brown bag” it. So what do I take with me for lunch? It varies from week to week (because boredom is a bad disease) but my go to lunch is super simple and relatively painless in the prep department which is even better! It’s nothing fancy or exciting but it’s filling and nutritious and like I said, pretty easy prep wise. I don’t eat this every week but maybe every other week. I only work a half day on Fridays so I have four days worth of lunch that I prep on the weekends. If I cook something fancy (and by fancy I mean something that requires ingredients being mixed together in any way), it may take longer, but this meal takes a few hours with cleanup and defrosting included. I buy frozen individually packaged chicken breasts (I dig the individually packaged variety simply because it cuts down on freezer burn. 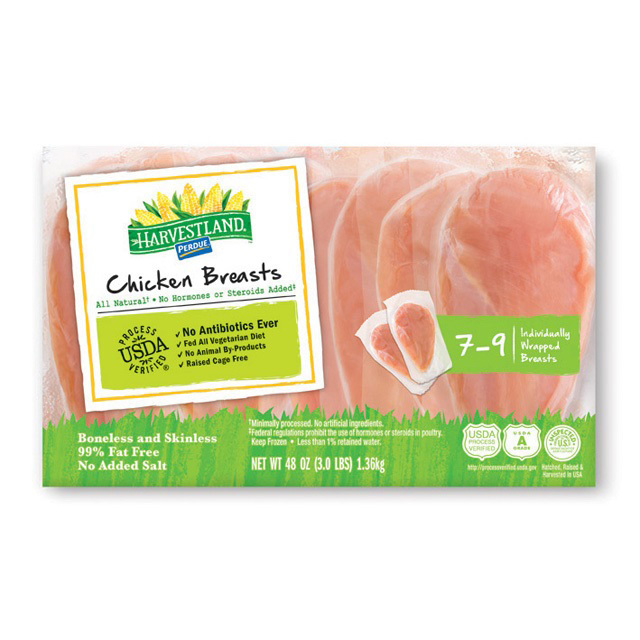 The bags of loose chicken breasts are cheaper if you’re being more budget conscious). In the past I generally bake the chicken in the oven but this week I used my fancy new George Foreman grill and it was awesome. I seasoned with a little salt and pepper and some lemon juice. Sometimes I use hot sauce if I’m feeling fancy. Really, use whatever seasonings you like, but if you’re trying to cut back on sugar, be sure to check the sugar content on any BBQ sauce or liquid marinades. Some of those delicious sauces are super sneaky sugar trains. I also prepared brown rice with a tablespoon of parmesan cheese for flavor (maybe someday I will be so healthy that I like plain brown rice but today is not that day). Lastly I added spinach. I most often will use broccoli for my greens but I love spinach and it is high in iron. I’m always a wee bit close to anemia and I’ve been feeling like I need additional iron in my diet the last few days. I almost always buy frozen veggies because they’re easy to prepare and store. I feel like for such an extremely simple post I’ve already jabbered on quite a bit so I’m going to wrap this up. Do you prep your lunches for the week? 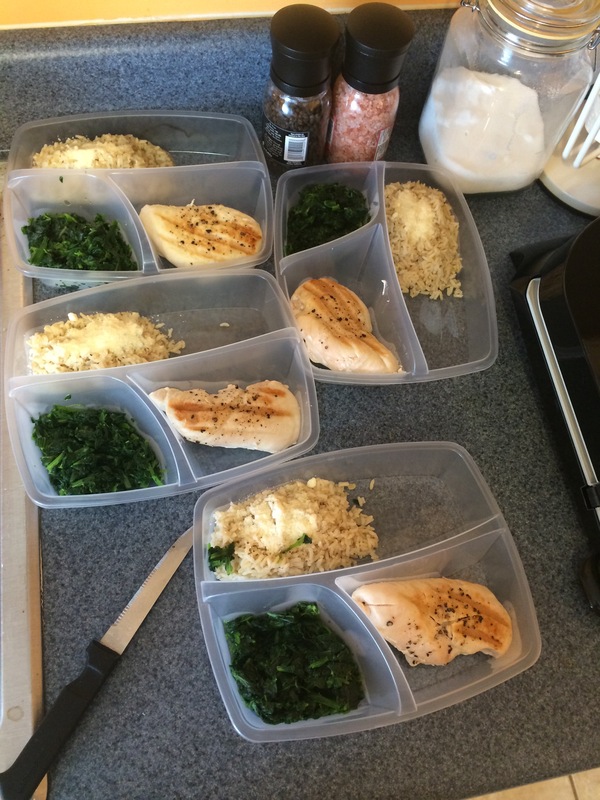 Lots of people prep their entire week worth of meals; breakfast, lunch, dinner, the whole shebang. Do you do that? If so, you’re a rock star! Do you have any awesome tips for making healthy meal choices? The Boy and I had an awesome day today. I did my meal prep, we got our housework done, then we went for a drive to a neighboring town where we ate ice cream cones, had scones and tea in a tea room, made a new friend, and wrapped up some of our Christmas shopping. It was really fun! I also feel like I’m in a bit of a sugar crash kind of situation at the moment. Totally worth it. Yesterday we came home to a decapitated squirrel on the kitchen floor. I took a picture but then decided that not everyone has a weird and morbid streak so I’m sparing you. You’re welcome. This is such an inspiring post! You really make me want to eat healthy. Maybe one day I can bring myself to like spinach… =S Keep up the good life! LOL @ the decapitated squirrel picture dilemma. Who did this? Is this some Godfather-esque threat? Was the head in your bed, on your pillow?? It felt very Godfather-esque! I was 100% expecting to find the head in my bed but it never did turn up. I’m not sure if that’s better or worse. Now that’s a scary thought! Don’t jump into bed without turning on the light! I can’t imagine not liking veggies. Lots of people don’t though!